When to Sell a Futures Option Strangle? What is the Risk of a Short Option Strangle? 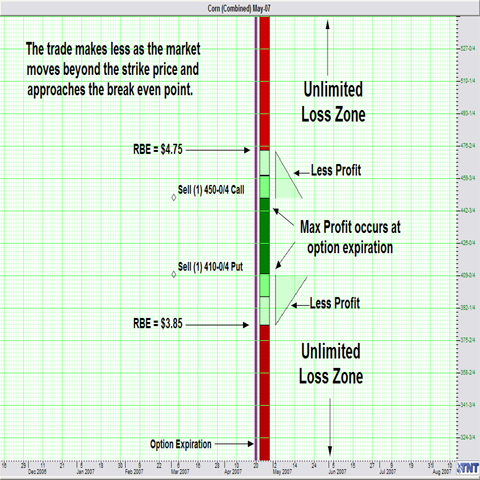 The risk and reward profile of a short strangle is exactly opposite of the long strangle. Plainly put, if the buyer of the strangle is profitable the seller is experiencing a loss and vice versa. Accordingly, where the long option strangle position has a break even point as calculated as the strike price plus or minus the premium paid, the seller has a reverse break even calculated by adding or subtracting the premium collected. In other words, the BE and the RBE will be the same figure for the buyer and the seller, but the profit zones will be opposite of each other. The buyer makes money if the market trades beyond their BE, the seller makes money if the market trades between the RBE. 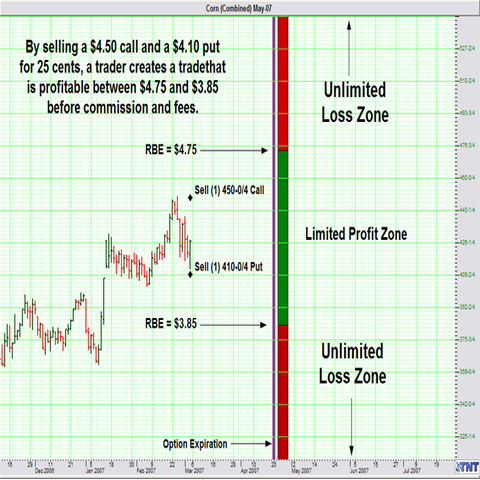 In this case, we are selling a corn strangle (short call and short put) for a total premium of 25 cents. If you recall, the $4.50 call had a premium of 10 cents and the $4.10 put was going for 15 cents. Of course, for the sake of simplicity, this example is hypothetical and doesn’t account for the bid / ask spread that the floor broker receives. A more realistic example would be a spread that can be bought for 25 cents could be sold for 24 cents. To calculate the reverse break even points for the trade, you simply add the total amount of premium collected (25 cents) to the strike price of the short call, and subtract the total amount of premium collected from the strike price of the short put. This creates a trade that is profitable anywhere between $4.75 ($4.50 + .25) and $3.85 ($4.10 - .25) before commissions and fees. Between these two points, the trader receives a limited profit, however the maximum profit only occurs if the market is trading between the strike prices of the strangle at expiration. Beyond the RBE’s of the trade, the position is exposed to theoretically unlimited losses. Thus, if the market drops below $3.85 before or at expiration, the position behaves similarly to a futures contract in that the risk is unlimited and the delta value is increased. Once again, the delta value of an at-the-money option is .50, so as the option becomes deeper in the money the delta value increases accordingly, but will never surpass the delta value of a futures contract, 1. So a deep in-the-money option is similar to holding a futures position in terms of risk and price fluctuation. The Reverse Break Even is calculated by adding the total premium collected to the call strike price and subtracting the total premium from the put strike price. The maximum profit of 25 cents occurs if the underlying futures contract is trading between $4.50 and $4.10 at expiration. Beyond the strike prices at expiration, the trader is giving back “profits”, or the premium collected, until they run out 25 cents above or below the strike price at the corresponding RBE. Between the strike price and the RBE, the trader is profitable but as the underlying futures contract gets farther beyond the strike price the profit is decreased tic for tic. For example, if the underlying futures contract was at $4.60 at expiration, the trade would be profitable by 15 cents before commission and fees. This is calculated by taking the difference between the strike price and the market, 10 cents, and subtracting that from the total premium collected, 25 cents (($4.60 - $4.50) - .25 = .15). Likewise, if the contract was at $4.70 at expiration the trade would only be profitable by 5 cents before commission and fees. A Strangle writer makes money anywhere between the RBE's, but makes less in between the strike price and the RBE. In our opinion, the decision between a long strangle and a short strangle depend on market characteristics and conditions. However, not all traders are monetarily and psychologically equipped to cope with the potential of theoretically unlimited risk. We are often asked which is the best trading, but the answer that we give frequently disappoints. The best strategy for you is the one that meets your objectives in terms of risk and reward and allows you to sleep soundly at night.